"HP" Gate Valve are heavy duty, bolted bonnet, rising stem with non-rising hand wheel, Also with straight through bore design assures minimum turbulence, corrosion and resistance to flow. "HP" Gate Valves is available in wide range of sizes these are widely suited for high pressure and Temperature and variety of fluids. We focus on delivering quality product solutions to our customers. We are in constant communication with our clients during product manufacturing and delivery. 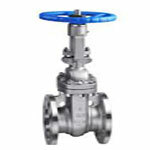 Our specialty is adoption of best tools or techniques for gate valve in India. We make sure that our wider product range is delivered in decided time frame only. It's a great pleasure to introduce ourselves as one of the Leading Manufactures, Suppliers and Exporters of Industrial Valves and Fitting, Like Gate Valve & Strainer etc.